You’ve been planning this surprise anniversary party for a couple of months, waiting for the early spring weather with sun shiny days and lovely early evenings. Cocktails on your patio from late afternoon into the dusk and beyond are so much more classy and comfortable under the protection of Eclipse Shading Systems® awnings and accessories. You always add refreshing home improvements such as your awnings one year, then patio upholstering to match – with the wide selection of Sunbrella fabrics, and since you’ll be the first in your neighborhood to entertain outdoors this spring, your company will be wondering what’s new this year. As your guests arrive, they gather on the back patio under the UV protection of your retractable awning and are served a festive cocktail of champagne, lemonade, and fresh raspberries with hors d’oeuvres to die for and still with no clue as to what changes you’ve made to enhance your outdoor retreat. 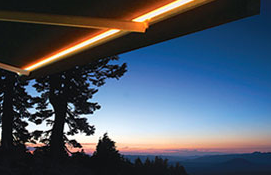 As the evening becomes cooler, you reveal your new chill-soothing Eclipse Solar Bean Infrared Heater! Wall or awning mounted, this unit provides a 1500-watt heater to complement your evening hours outdoors. As the sun begins to fade and your friends are cozy with the heat, you reveal the next surprise – the Eclipse Lunar Lighting Package to add the soft glow of natural light! And no worries if it gets cloudy because your awning fabric is made to protect you from a little light rain. Create a more exciting and comfortable outdoor living environment with the help of shading options and accessories from Eclipse Shading Systems®. With thoughts of summer under your Eclipse retractable awnings, christen the season with early spring surprises for your guests. Good friends stay later and everyone parties on into the night with the help of light and warmth from the Eclipse Solar Beam Infrared Heater and the Eclipse Lighting Package. Talk to your local Eclipse dealer and find your life under the awning.